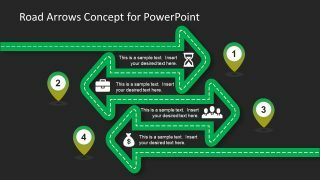 The Road Arrows Concept for PowerPoint is an outstanding design of a path leading to certain points. It is a template for many possible scenarios. Such as, step-by-step process diagram, timeline, planning or general roads related presentations. 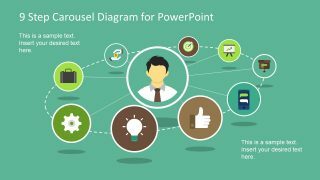 The visual illustrations of this PowerPoint aids in creating a lasting impact on audience. Set forth a start to finish roadway template for an absolute success. 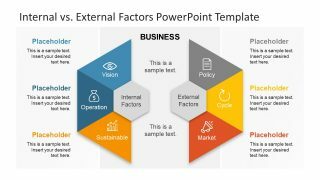 This PowerPoint template is suitable for finance, marketing and sales related presentations. It is also a stimulating strategy to present multi-stage process in a project. An amazing vector design created by professionals is easily applicable in basic to advance milestone mapping. 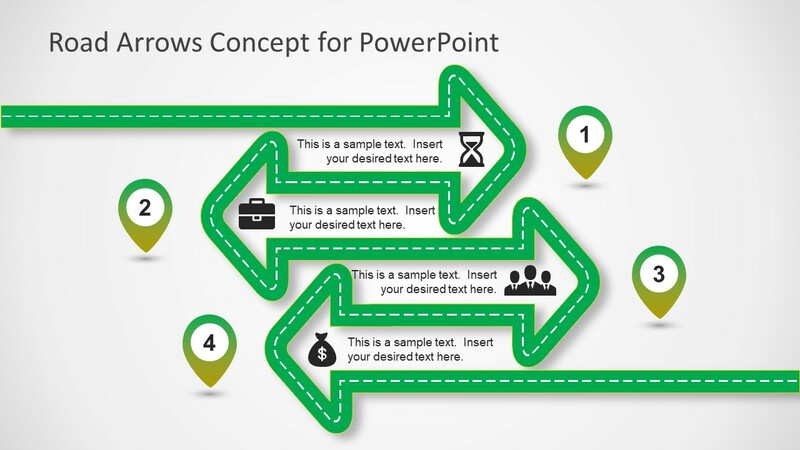 An appealing Road Arrows Concept for PowerPoint enhances company’s outlook and inspire viewers. The use of engaging business-related graphics motivates the staff with the sense of duty. Whereas, utilizing it with reports portrays a professional image of an organization. Moreover, the shapes and icons along the pathway helps entrepreneurs to successfully present an innovative business idea. Although, it is a great way of demonstrating new product strategy and its forecast report. The roadmap timeline, when implemented effectively, can take off considerable workload while developing a new product. It provides and overview of major activities and targets to achieve. Ultimately, serving as an effective source to communicate objectives and expectation of an organization. 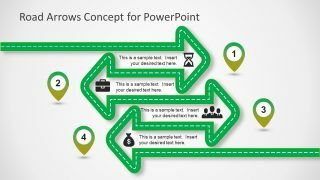 This Road Arrows Concept for PowerPoint is a template containing two slides of different background each. The path is fashioned in the shape of curved arrow PowerPoint. The arrows are pointing towards four separate infographics. The icons including hourglass, briefcase, businessmen, and money pouch infographics. The segments are also numbered, displayed in location marker icon with gradient shade of road path. The placeholders for texts besides icons are for adding appropriate data. 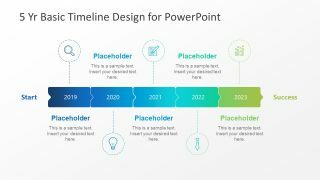 The Road Arrow Concept for PowerPoint is an editable template design. 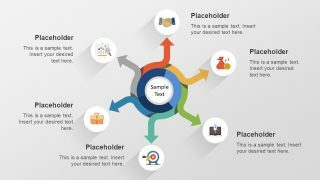 It helps users to make customizations in the design, layout and theme of the presentation. For instance, edit the outline and base color of road. First, select the path shape and open format tool menu. Here, select from pallets in shape fill and shape outline. Further, users can customize the slides according to main theme of presentation.